It’s Mental Health Awareness Week. For seven days, from 8th to 14th May 2017, organisations and individuals are shining a light on the subject that for many is still surrounded by stigma. This week is all about reducing the stigma, finding out why mental health is a daily challenge for such a large portion of the population, and this year, uncovering why too few of us are thriving with great mental health. In a recent interview Sam Jones, MD at Manchester content agency Tunafish Media, did just that. The 29 year old entrepreneur spoke with Business Cloud’s Chris Maguire about his experience with anxiety in the workplace as a business owner and a prominent figure in the city’s digital-sphere. Having kept his anxiety to himself throughout school and university, three years ago Sam found himself discussing the subject out in the open following an attack in front of colleagues and employees. He said: “I can feel it [an anxiety attack] building in my chest a couple of days before, it’s a strange feeling. When it happens, I just can’t catch my breath. When Chris asks if Sam has ever sought help for his anxiety, the young MD speaks of attending therapy sessions during his time at university that were kept secret from his family due to the stigma that is so often attached to mental health. Technology has a huge role to play in the future of treating mental health. It makes perfect sense that these two worlds should interlink as more of us start to wear our smart technology 24/7, enabling it to monitor everything from our heart-rates and steps to our calorie intake. So why not use all of this great behavioural data to learn more about our mental health and break-down the barriers? NHS approved apps such as Silver Chart and Stress and Anxiety Companion are already available, helping more of us manage our mental health every day. 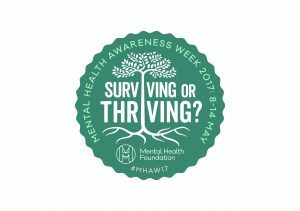 Mental Health Awareness Week is about raising awareness and that means talking to those around you about mental health to reduce the stigma. All you need to do is take five minutes, look around at the people you work with every day, and ask how they are. You never know when someone just needs to be asked.